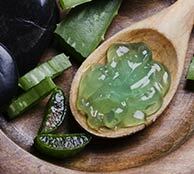 It’s easy to whip up a few quick recipes using Aloe Vera as the main ingredient. 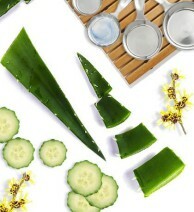 Peel and slice the aloe leaf to extract gel. Put the cucumber and aloe gel into a blender and process until smooth. Strain the mixture through a sieve to extract the juice, setting aside ½ cup of the strained juice. Add the witch hazel to a small pan, whisk in the gelatin and add the teabag. Gently heat the mixture until it just starts to thicken. Remove from heat. As it cools, remove the teabag, then whisk in the cucumber and aloe juice mixture and add the peppermint oil. Pour the gel into a sterilized, airtight pump dispenser. Apply to the eye area before bed and wash off in the morning. Mix ingredients in a bowl with a wire whisk. Put in freezer and wait a few hours until frozen completely. Defrost one cube in a bowl the night before use. Use as you would normal shampoo. Peel and cut the cucumber (either dice it or put into a food processor). If using a processor, strain through a cheesecloth to extract the cucumber essence and to keep the mist light. Include some of the diced pieces in the mix. 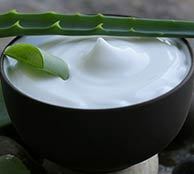 Pour into a glass spray bottle with the water, aloe vera, witch hazel and shake.